Subrata Mazumdar (Anil Chatterjee) is a bank employee. He heads a large household. There’s his retired schoolteacher father (Haren Chatterjee) and his mother (Sefalika Devi). There’s also his younger sister Bani (Jaya Bhaduri), his wife Arati (Madhabi Mukherjee), and their son Pintu (Prasenjit Sarkar). With so many mouths to feed and no other income, Subrata is having a hard time making ends meet. Arati wants to work and help out with the finances. She gets a job selling knitting machines… but it threatens to tear apart the home, with a jealous husband, a conservative father-in-law, and a child who feels neglected. This is my 6th time watching this film and I have yet to write a thorough review, despite the fact that the movie currently sits at my #2 of all time. What makes it so compelling to me? For one thing, it’s the type of small drama that I’m usually attracted to. I tend not to go for large-scale, life and death situations. I like to see ordinary people struggling with everyday problems. How do we communicate with each other when it’s so easy to hurt someone? What do we say with our glances, gestures and postures? How we get on with the job of just living from day to day, trying to survive and do the right thing? And Ray packs so much into such a small box. I quote my first review of this film: “pride, shame, integrity, jealousy, family, the value of work”. All of these themes are touched on to various degrees, without feeling like its being shoved down your throat. From a simple situation, he presents a wide range of humanity, yet never straying from the narrative roots of the tale. Every scene has a rich fascination not only because we care about the characters, but because we care about ourselves. There is also an elegant simplicity to the camerawork. Not as visually flashy or impressive as Charulata, but there is impeccable framing and a willingness to let the faces do the talking without too much fussy attention to detail. When Arati tosses her lipstick out the window, we don’t even see the object. There’s no cutaway to it clattering on the road below. All we need is hear the sound… it’s far more important to stay on Arati’s face. 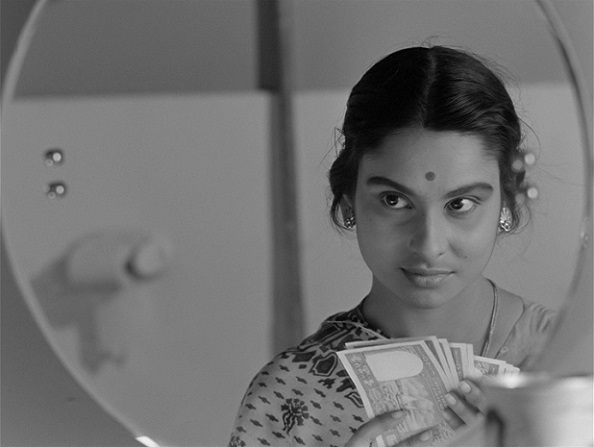 And that brings me to another marvelous facet of this film: Madhabi Mukherjee. Her performance is absolutely one of my favorites. Arati almost seems too perfect a character, almost saintly in her tolerance of the grief she gets from her family. But there are moments where you can see the resentment boiling in her eyes, before she tamps it down and puts on a brave face… as a woman in 1960’s India, probably something she’s had to do many times to keep the peace. This entry was posted on September 30, 2013 at 5:24 pm	and is filed under Movie Reviews. You can follow any responses to this entry through the RSS 2.0 feed. You can leave a response, or trackback from your own site.